This guide is written with the needs of academic staff and higher degree research students in mind. 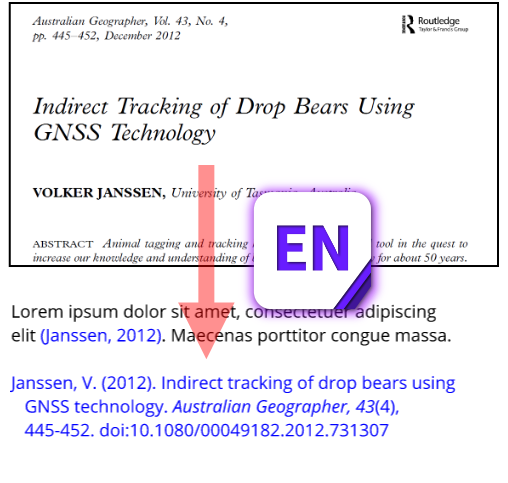 Undergraduates are encouraged to see the guide for EndNote Web - easy and online! I understand I am downloading the ENDNOTE software under the conditions of an agreement between Federation University and ISI ResearchSoft Inc. I may only load the software onto a University owned computer or my personal computer, for use in my learning or research studies. I am aware of and understand the Regulations of Federation University regarding the use of computing and communications facilities. Before installing EndNote: Close down any programs in the Office suite of programs (includes Outlook). Installation security issues? Read this first. The two files in the Windows download MUST be copied from the downloaded zip file into another destination folder first (your Windows desktop is OK). Do this before running the installer (ENX8Inst) from the destination folder. DO NOT attempt to run the installer by double-clicking on the download, then directly double-clicking on ENX8Inst in the preview. Click the search icon near the bottom left corner of your screen. Click the Software Center in the list of search results. From time to time EndNote will provide update patches to fix problems and improve performance. If you get a notification about an update whenever you start EndNote, the Library recommends you download and install the update.